FACT: Each and every day you’re losing business because your website is underperforming. Would you like to learn how to strengthen its performance and generate more business online? According to Hubspot, 99% of first time website visitors are not ready to buy. Forrester found that 74% of B2B buyers conduct more than half of their research online before even talking to a salesperson. These stats show that today’s buyer doesn’t want to be pitched a product or service until they have a thorough understanding of the problem they’re facing and the range of solutions available to solve their problems. Unfortunately, many company websites are only focused on the small 1% of visitors that are ready to buy, equating to a lot of missed opportunity. To grow, forward-looking businesses need to embrace these trends and develop strategies to engage the neglected 99% in an online exercise or dialogue. This exercise should move them from awareness of their problem, through the research and decision process, closing with them becoming a customer and eventually an advocate. So how do companies create these online engagements? The answer... by creating a powerful sales and marketing funnel. A sales and marketing funnel takes your offline sales process and mimicks it online while automating the entire process using marketing automation. Done well, your funnel should educate, build trust, and gently guide the consumer through their natural buying process, cueing them subtle nudges along the way if they get stuck. And when the prospect is sufficiently warmed up and educated, which you’re able to monitor using marketing automation tools, sales can step in and close the deal. Before you create any marketing strategy, sales process, or on occasion before you create a product or service, understanding your buyer is a non-negotiable. Step one is to perform some form of qualitative and quantitative target audience research to develop buyer personas. A buyer persona is essentially an avatar of what your ideal customer looks like, what motivates them, their pain-points, their hopes, their desires… Creating buyer personas can help you build better products, plan more effective marketing strategies, and guide more productive sales conversations. Have you created buyer personas for your business? If the answer is no, stop reading this post right now and do it! Need help? Click here to download our buyer persona toolkit. Marketing funnel automation tools are not absolutely necessary to develop your funnel, but they’re damn near close. Save massive amounts of time by streamlining the processes involved in building and maintaining your funnels. Assist in segmenting leads and tracking behavior patterns to help sales easily find the best opportunities. Help close the loop on the marketing and sales teams to see which marketing campaigns and channels are most effective so that budgets are optimized. We could go on and on about the benefits of marketing automation software, and it’s true many of these things can be accomplished without using a tool, but be prepared to work much harder and have less visibility into what’s working and what’s not. Now that you’re thoroughly convinced that you need a marketing automation tool let’s discuss your options. There are an overwhelming amount of marketing automation tools available on the market today. If you listen really closely, you can hear the marketing automation fairy creating a new one as we speak. But seriously it’s a little ridiculous, so I’ll try to help you narrow down your choices. In our opinion there are four that really stand out; Hubspot, Marketo, Pardot, and Infusionsoft. Pardot has some work to do before we're convinced they’re in the same arena as Hubspot and Marketo, but they are owned by Salesforce so that’s not out of the question. InfusionSoft is best if you’re selling informational products or products where upsells and cross-sell capability is important. So that leaves us with Hubspot and Marketo. We believe these are your two best options. 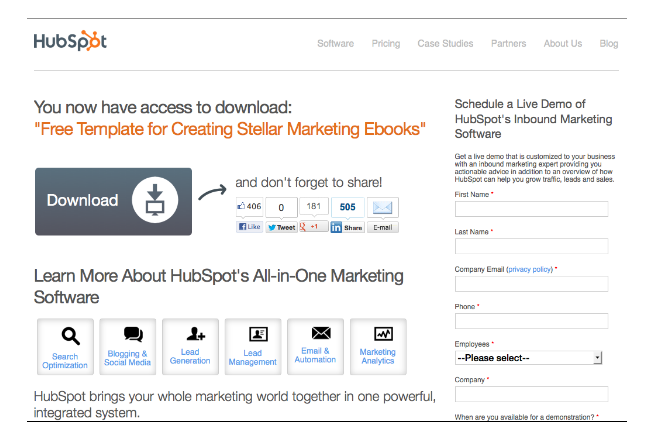 We're a HUGE Hubspot fan. We just love everything they do. To be fully transparent Trevelino/Keller is also a Hubspot agency, so in an effort to be unbiased we will defer to Aleks Peterson of TechnologyAdvice.com who gives an excellent side-by-side comparison in the video below. Follow Alek on Twitter @alekspeterson for more marketing automation comparisons. The foundational pieces of a sales and marketing funnel are; the lead magnet (checklists, ebooks, blog subscription, newsletter signup, free consultation, etc. ), a call to action button, a landing page, a thank you page, and lead nurturing that includes email and remarketing. This is a good explanation but I like to break customer journeys down even further based on brand awareness and recognition. Aiden Marketing gives an excellent explanation of these stages here. For longer buyer journeys, more persuasion is needed and that means more content offers, more lead nurturing sequences, and more remarketing campaigns to move your prospect through these three stages. Before building your sales and marketing funnel, schedule a group planning session using your buyer personas to map content to each stage of the customer’s journey from, awareness to decision. Strategize not only what type of content you’ll need to create for each stage, but in what format and through which channels you want to deliver this content. Here are some questions to think about as you map your content. Think about the common types of problems your ideal customers are having that might trigger them to search for information online. What questions are they asking online to find information to help them solve that problem? What work around are they currently using to solve that problem that your solution makes obsolete? What are the different types of solutions to this problem? What are the pros and cons of each? What are the different types of solutions to this problem? What are the pros and cons of each of these solutions? How does your solution compare to other options? At this point, your prospect knows what type of solution they want to purchase, now they are comparing brands that offer this solution. What sets you apart from the competition? How do the features of your product or service compare to the competitors? Do you have social proof? i.e. case studies, video demos showing how your product solves the problem, testimonials, influencer reviews, etc. 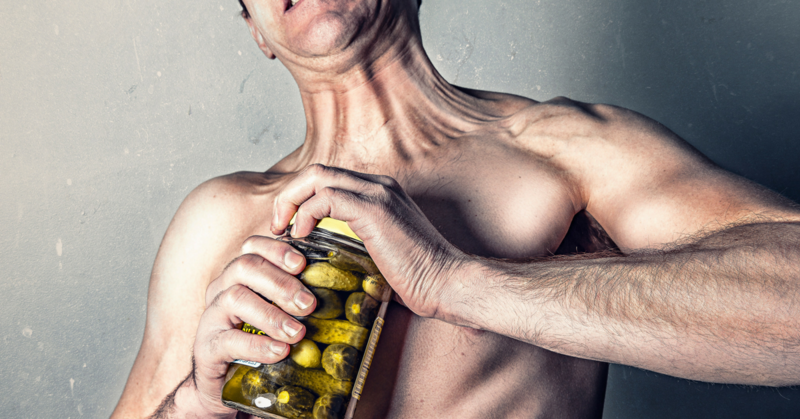 What are the common objections your sales people hear? To activate the steps of your sales and marketing funnel you must first convert site visitors into leads. The most effective way to do this is by creating conversion opportunities that are less threatening than “buy now” or “contact us” and assist in the buyer’s research process, which we’ve seen typically precedes purchase. Lead magnets can come in a variety of different formats. You should try to have a hyper relevant lead magnet for almost every page on your site, particularly informational site content such as blog posts. Sound like a lot of work? Here’s a post by Bryan outlining, step-by-step, 11 ways to quickly create lead magnets for each blog post you write. Lead Magnets: 11 Ways to Get More Subscribers - As a bonus you can download all 34 lead magnet ideas to use in your business. From here on out we’ll refer to a call-to-action as CTA. As stated above, you should try to have a relevant lead magnet for each page of your site. The CTA is used to take people from the page they’re on to the landing page where they can access the lead magnet. The type of offer you’re CTA is promoting depends on the content of the page it resides on and which stage of your funnel this page is mapped to. 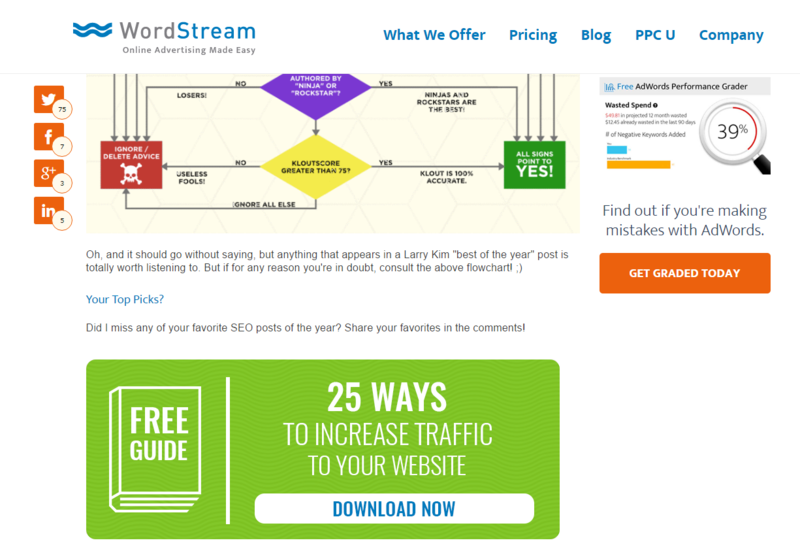 Here’s an example of a CTA found on the homepage of Wordstream, a paid search and social advertising management tool. Typically someone who finds the homepage of a website is either a.) familiar with the brand and therefore comes to the site directly by searching for the brand name or typing the URL directly into the address bar, or b.) has found the site organically using searches that are closely related to what the brand offers. Since Wordstream is a well known paid search management tool and does very well organically in the search engines for keyword phrases related to paid search management, getting a free PPC account analysis would be a relevant and extremely enticing call-to-action for anyone who found Wordstream’s homepage. This type of offer would fit perfectly in the consideration stage of the funnel because a visitor who signs up for a free PPC account analysis most likely has a PPC account and now they’re are researching solutions to help them improve their account results. The CTA is promoting 25 ways to increase website traffic which is very relevant to someone who is interested in SEO. This type of offer would fit perfectly in the awareness stage of the funnel since someone who downloads this offer is wanting to increase traffic to their website and researching ways to accomplish this goal. PPC happens to be one of the 25 ways. Wordstream can now use lead nurturing to further educate the new lead on why PPC is an excellent tactic for driving traffic and how using Wordstream can help improve PPC results. Here’s a shortlist of best practices to think about when creating your CTA. Action-oriented: using verbs like "Download" or "Register"
For a more in-depth list, here’s a list by Megan Marrs on the Wordstream blog with 17 best practices to follow when creating your call-to-action. If you need help designing attractive CTAs here are 50 free call-to-action templates in PowerPoint for designing customized CTAs of your own. A landing page is the page that someone “lands” on after clicking your call-to-action. The one and only goal of this page is to capture visitor contact information along with any data that will help qualify them for sales. To capture the visitor’s information there is a value exchange that needs to happen. You, the marketer, gives the visitor a highly valuable piece of content (the offer), in-exchange for the information you need to further market to them. To capture this information, the landing page must have a form that includes a field for every piece of information you need to gather on your prospect to effectively market to them. The hero shot - A visual representation (image or video) of your offer that demonstrates how your product or service actually works so your prospects can picture themselves using it. Want to learn more about how to create the best landing pages? Unbounce created an awesome landing page course which you can access here. Once you’ve started the conversation, (i.e. converted a visitor into a lead) the prospect is on your email list. You can now continue the conversation, building trust and authority through lead nurturing. Think of lead nurturing as a subtle cyberspace nudge to keep them moving through your sales process. Answer common questions that come up in the sales process - create blog posts or short videos that answer these questions then link to them in your email and remarketing ads. Build authority and trust using case studies and testimonials - case studies should go by a brand standardized template and videos work great for testimonials. Show how products/services solve the specific problem the customer is facing - video demos work great for products. For service based businesses create customer case studies in story format where a customer faced a similar problem then explain in detail how you solved this problem. Respond to common pushbacks - these can be answered directly in the email, but remember to link to any supporting content that backs up your response. According to the Online Marketing Institute it can take 7 to 13+ touches before a prospect is ready to buy from you. By integrating email and remarketing into your lead nurturing process, you can accelerate these touches and create the appearance of a large authoritative brand no matter what your size. Each piece of lead nurturing content should be mapped to the most appropriate stage of the buyer’s journey, and delivered via email and display/social remarketing ads on the channels they frequent most to help shorten the sales process. All lead nurturing content should include a call-to-action that prompts the prospect to take the next step in your funnel, where they will receive new, stage appropriate content. This process repeats itself until the prospect gets to the final stage and buys your product or service. But don’t stop there, nurture these new customers to create raving fans and brand advocates to help spread brand awareness. This post has showed you the foundational philosophies as to why you need a sales and marketing funnel for your website, giving you the essential elements that make up a funnel, and outlined how to create each of the pieces of the puzzle. Take the information in this post, along with what you know about your buyer, go build your first sales and marketing funnel, promote it and iterate as needed. The more funnels you create, the better you’ll understand what your audience is interested in and the more effective your marketing will become. We want to hear what you think. Is there anything we missed? Steps? New cool tools to improve this process? Leave us a comment and let us know.